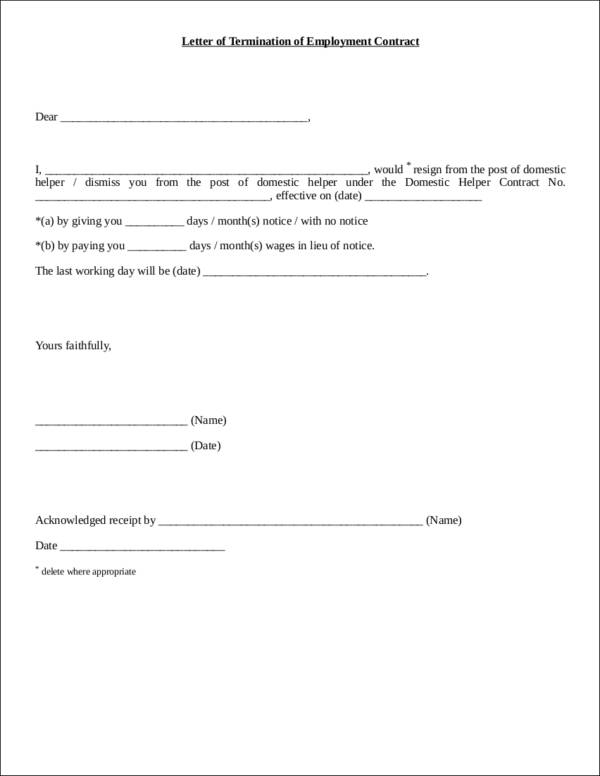 There might come a time where you may opt to end a basic contract that you are involved in. 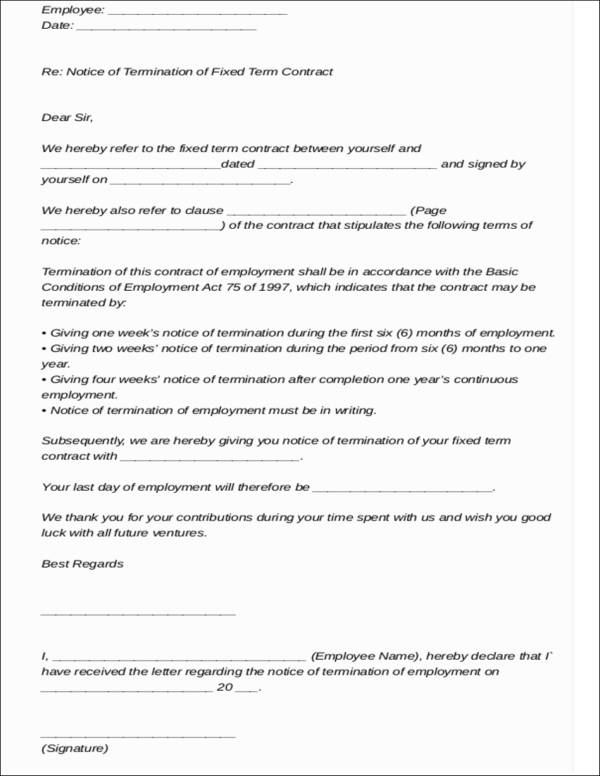 There are a lot of reasons involved in contract terminations. If you are confused about that, you can continue reading this article to find out more. 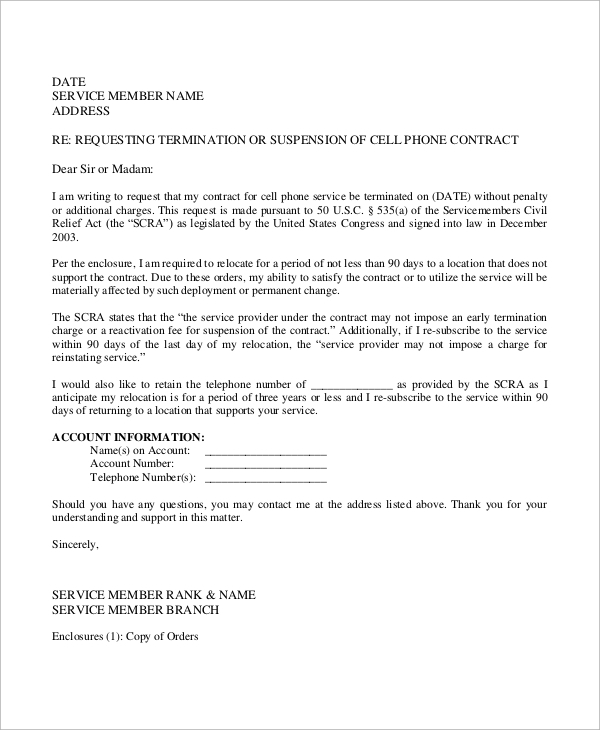 In this article, we also have a few contract termination letters that can be helpful in assisting you with ending your contract properly. The samples we have are compatible with a lot of devices available, so you need not worry about how you can edit the contract samples you have chosen. Keep reading this article to gain more knowledge. 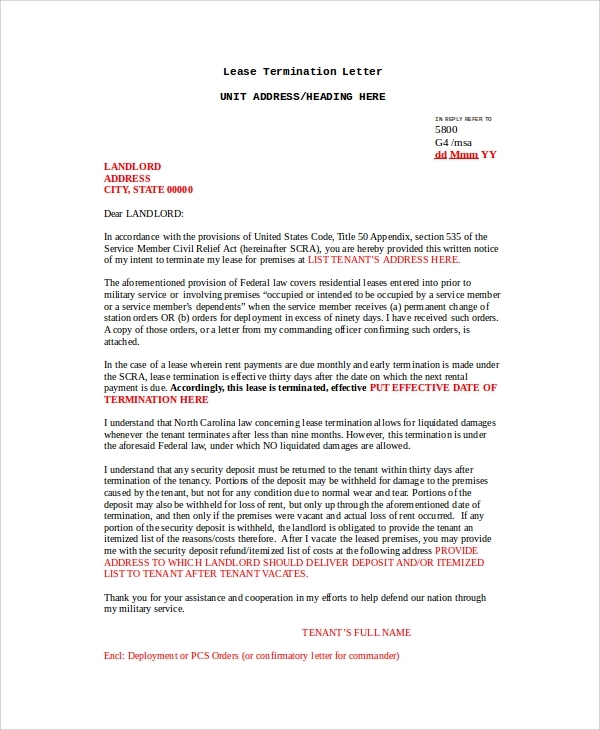 If you want to check out the basics of a contract termination letter, we have brought a few samples that would be great references. 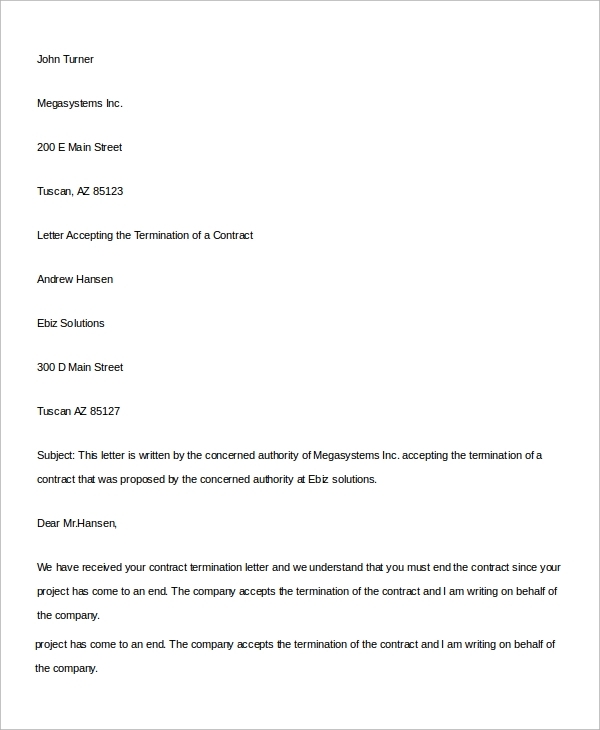 The basic sample contract termination letters in this section of the article showcase the best formatting style that you can follow when it comes to writing termination letters. It also showcases some of the most appropriate font styles and layout that is deemed to be appropriate for these types of letters. 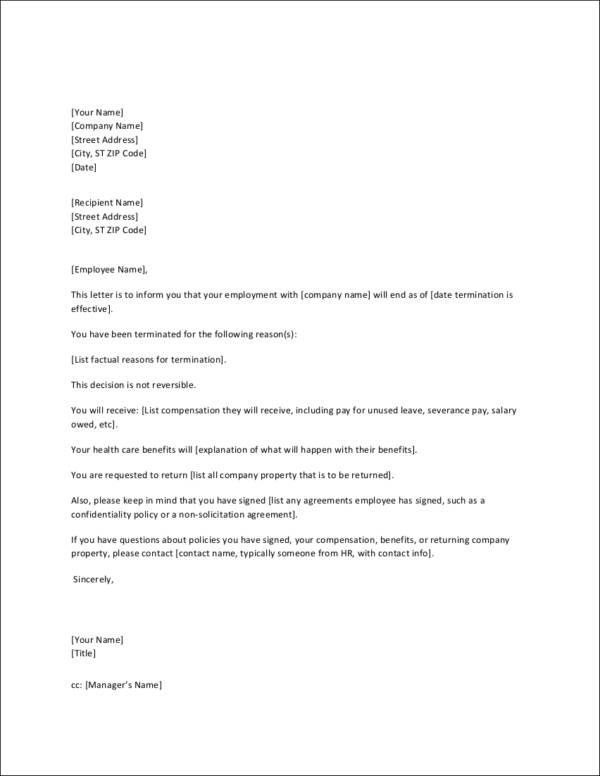 The basic termination letter samples and templates that we have here will assist you to write a business contract termination letter that would be easy to understand as it has all the key elements that will help to end the terms of the contract in a civilized manner. 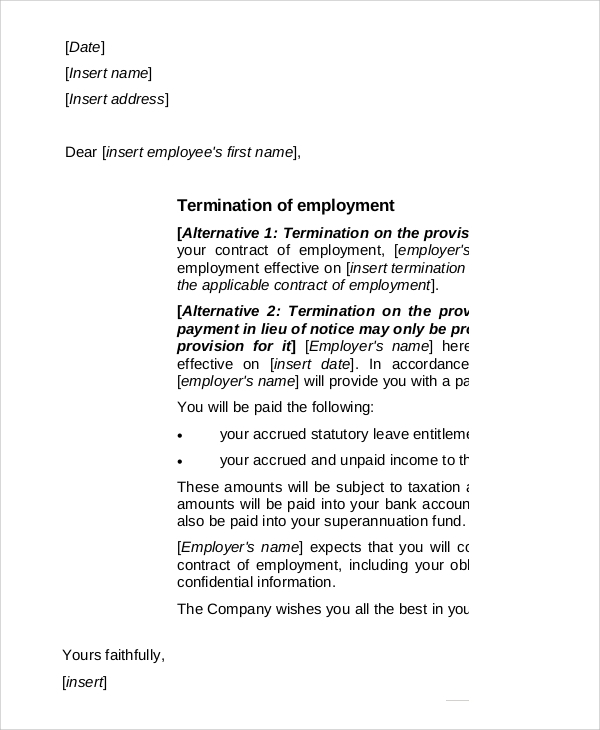 Check out some of the basics of contract termination letters right here. 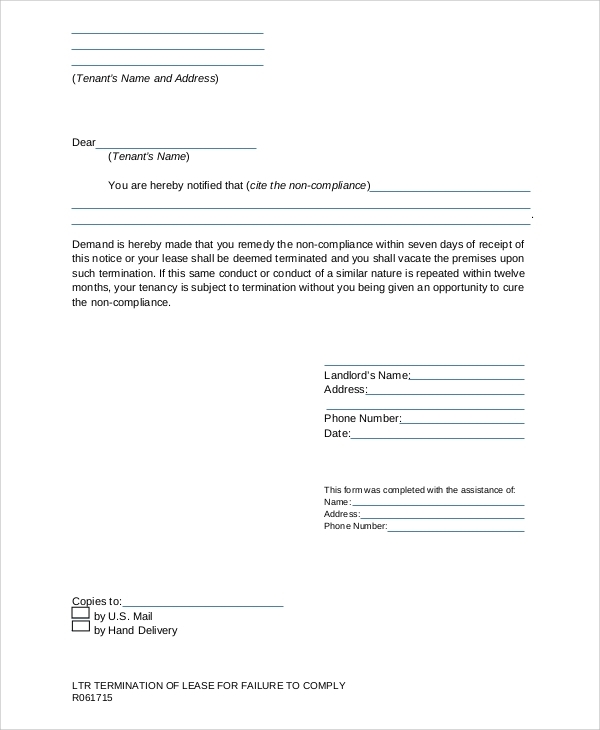 Basically, a contract termination letter format is a document that is written by one of the parties involved in the contract. It will typically be written in order to have a proper paper trail of properly ending a legally binding contract between the parties involved. 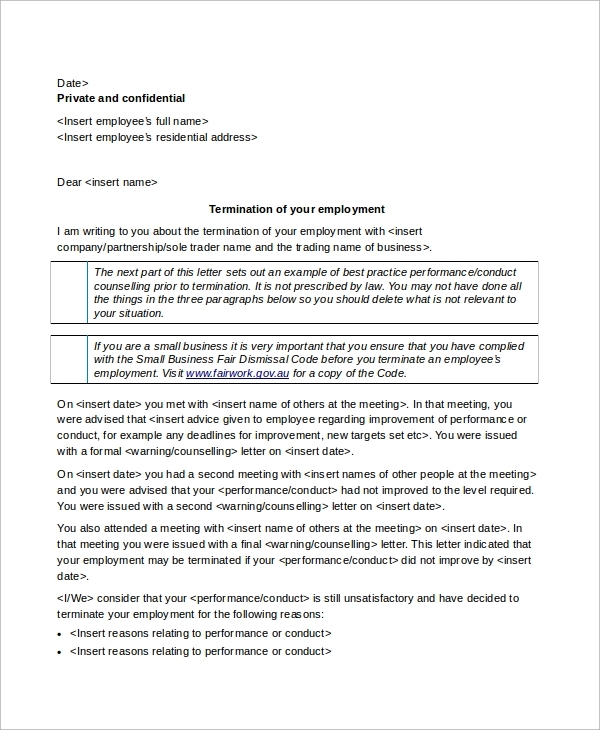 All important details such as the date of the termination and the exact details about the reason/s why the job termination needs to push through. Everything in the letter should be stated in a clear manner to ensure that misunderstandings and confusions do not occur. There is wide variety of reasons why one of the parties involved in an sample agreement might decide to end the contract. One of the reasons might be that there are certain conditions that have changed or have not been met. On other times, contracts are voided to ensure that no further damage is going to be committed. In this portion of the article, we will let you in on a few tips that will greatly help you out when it comes to terminating contracts. 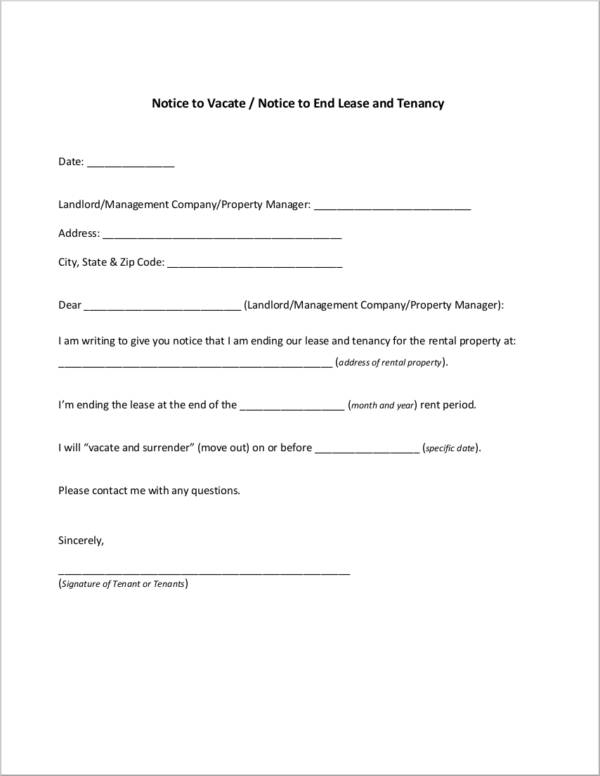 You may use a termination clause found in the contract and use it as a means of being able to take all of the necessary steps to properly end the termination contract without committing any damages or, at least, avoiding major ones. 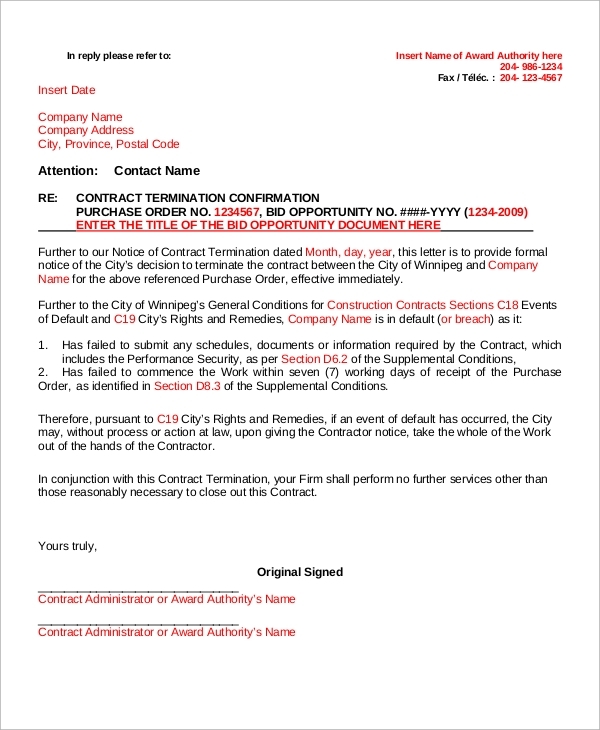 Typically, a termination clause will say that the person who initiates the want to end the contract should notify the other party or parties involved with the contract. It will also state that it should be in writing and that it should at least be a 30-day notice. 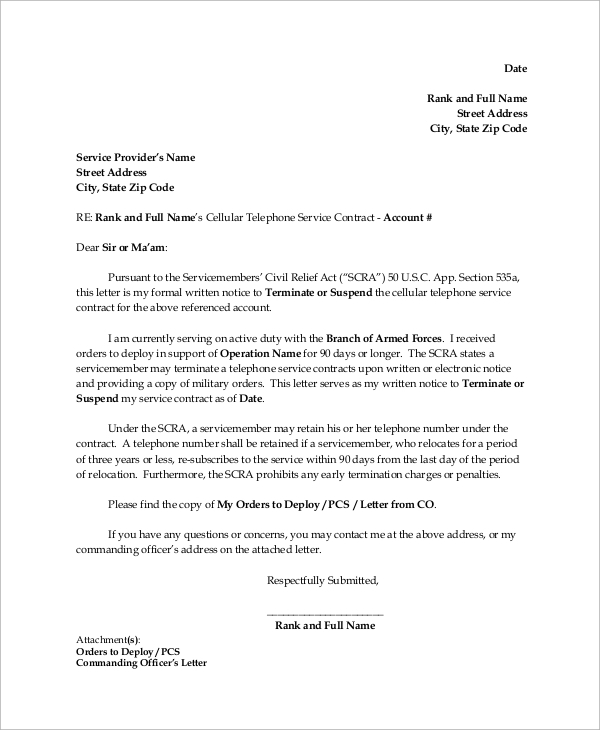 It may also state any fees that are involved should the situation be one where the termination would call for a contract to be terminated early. If for some reason deemed to be impossible hinders you from performing the obligations stated in the contract, you have a legal right to end the contract amendment. It can either be due to an act of someone involved in with the contract or due to an act of nature such as storms, hurricanes, or tornado. A frustration of purpose typically occurs when the reason or reasons for entering the contract is no longer existing. To end a contract with a frustration of purpose, the people involved with the contract termination agreement should be aware of the purpose of entering the contract. If one of the parties involved in the contract is not performing the stated duties and obligations, the other party may choose to end his end of the contract agreement. You may attempt to negotiate the end of a contract. You may opt to meet with the other parties involved and end the contract on mutual confidentiality agreement. Some of the negotiations could be opting to pay for cancellation fees, returning capital shares or funds contributed, or continuing the contract for a few more months given that outcomes will be better and that everyone involved agrees with the negotiations. 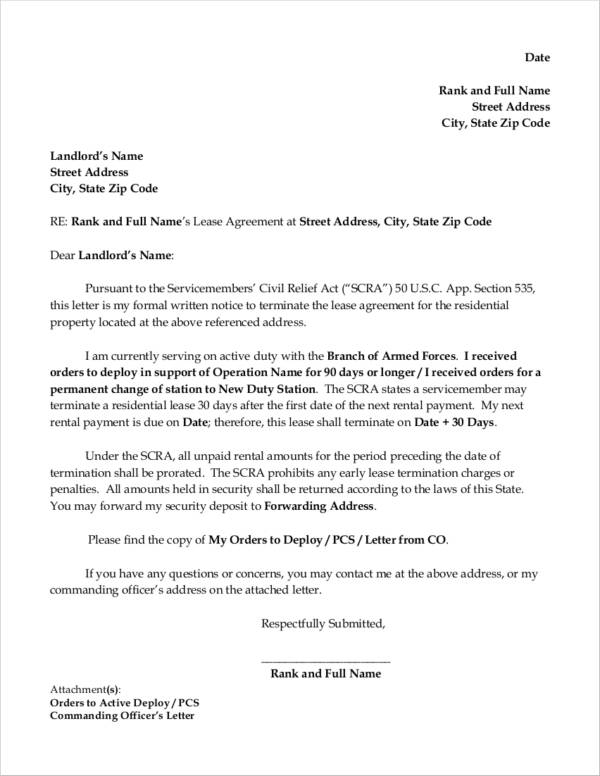 It will be a good idea to have the new lease agreements in writing that is signed by the parties involved. 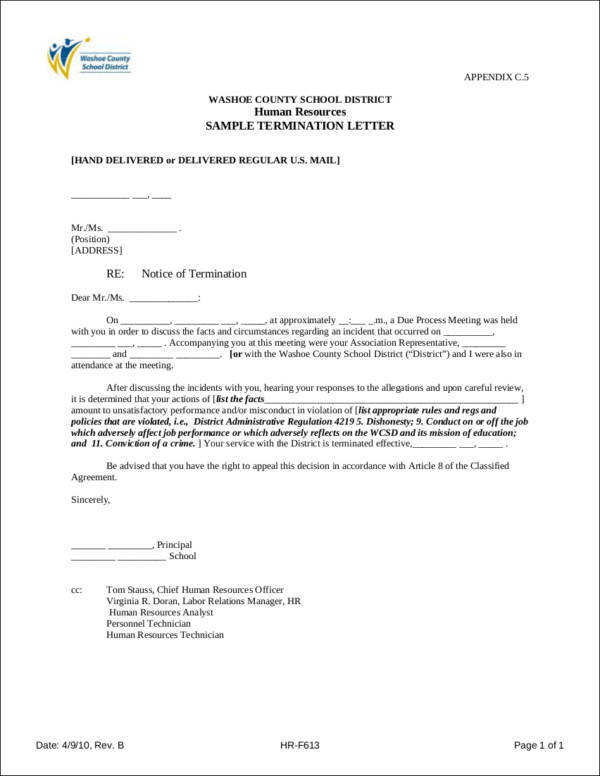 In an office or employment setting, there might come a time where you might need to draft an employment termination letter to properly document the termination of an employee. There are several reasons why an employee is being terminated from his/her job. It could either be due to the employee’s doing or the company might need to cut back on overhead expenses. 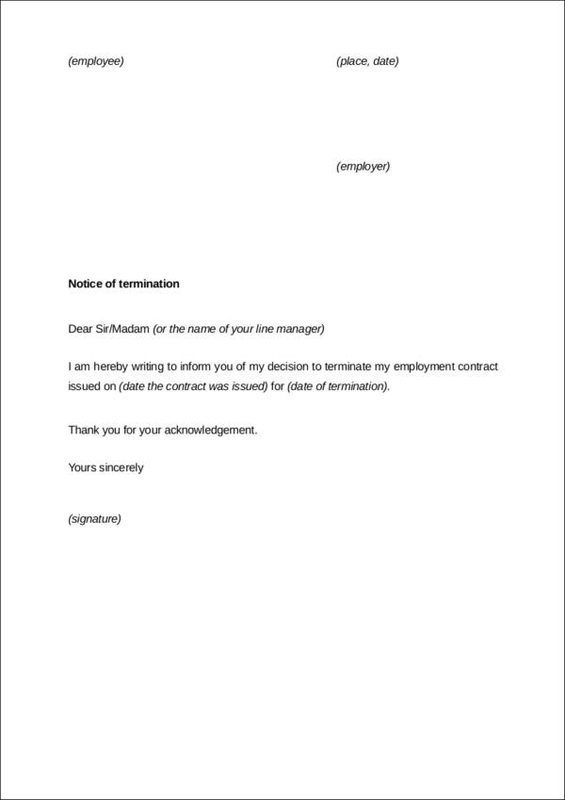 If you find yourself trying to get a hold of perfect—or at least close to perfect—examples for employment contract termination letters, we have a few sample employment termination letters that are going to help you get started with drafting a well-written employment contract termination letter. Check if one of the parties did commit a breach in the contract. A breach can be indicated as a failure to perform assigned duties as stated in the contract and any words or actions that imply a failure to perform in the future as well. If you are the one affected by the breach, you can mitigate the damages that you are entitled to. You can ask the party who committed the breach to pay for the damages. If you opt to refuse doing what you should do as stated in the contract, it constitutes to a breach of employment contract. If you choose this option, you should consult your attorney and ask for guidance. You can file for a lawsuit for the damages incurred due to the committed breach. You can hire a lawyer to help you out with the lawsuit. 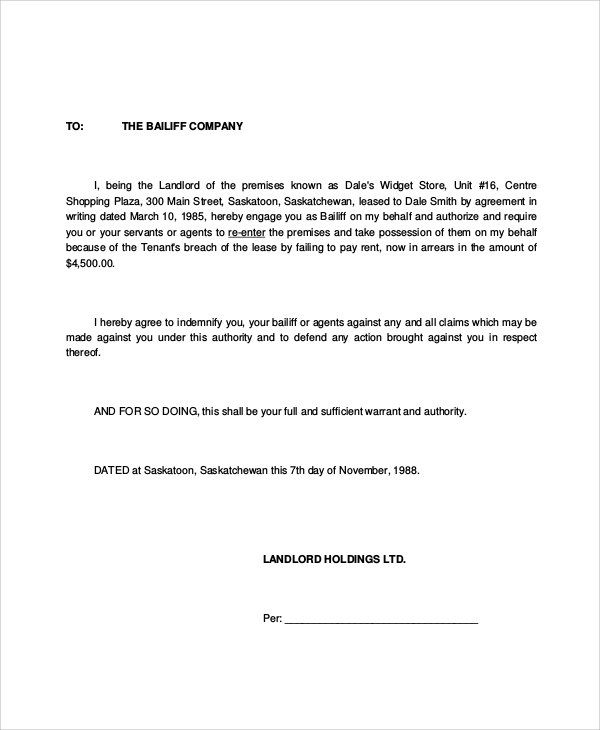 You can find more about breach of contract at Remedies for Contract Breaches. 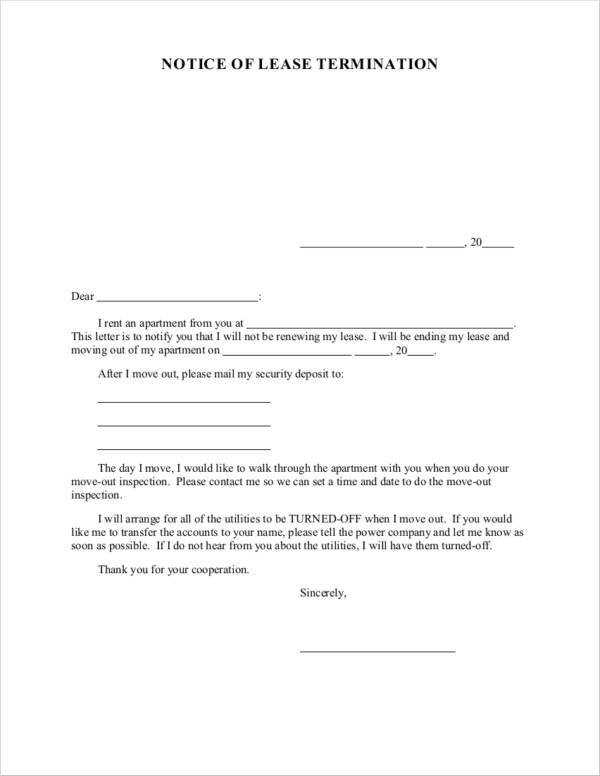 Renting an apartment or a space oftentimes comes with a rental contract agreement that needs to be followed by the party who wants to rent the property. There are times, however, when one of the parties involved in this situation might have to end the rental contract. 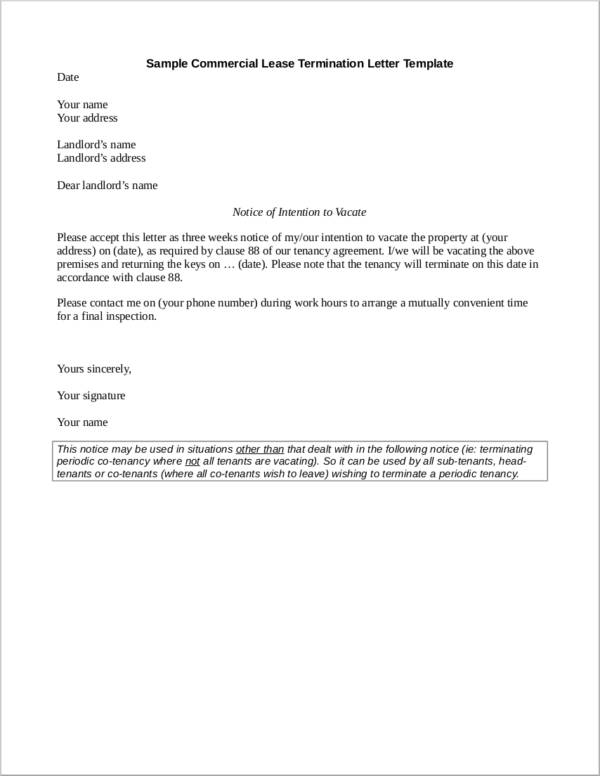 When it comes to rental contract termination, the termination letter can either be issued by the landlord to the party renting the property or it can be the other way around. 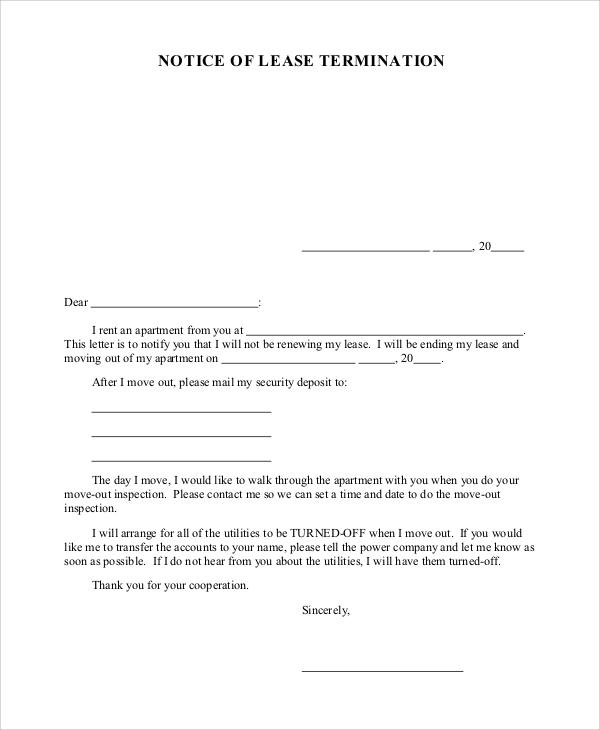 If you are looking for residential contract termination letter example, we have a few just for you! Check them all out below. 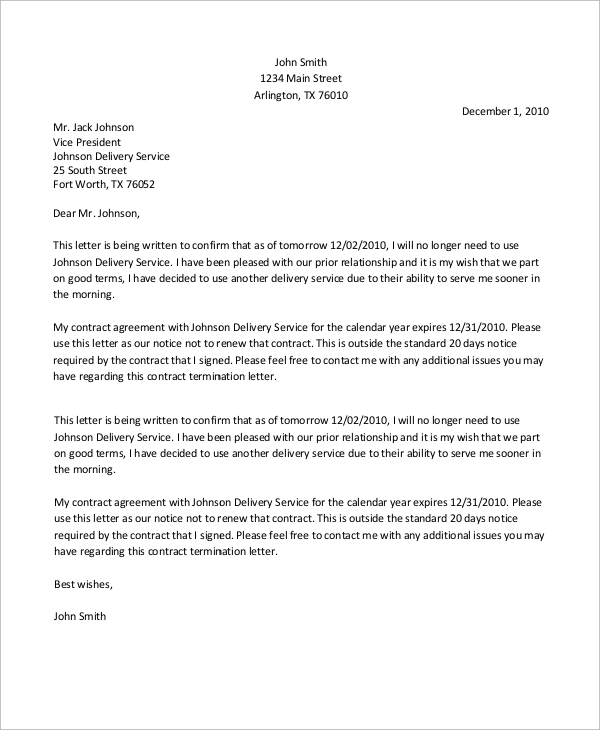 You can find clauses in the contract regarding how you can cancel the contract and the allowed amount of time when a contract is valid for cancellation. Should you decide to cancel the contract termination agreement, you should follow the steps involved with canceling a contract. If a contract does not have a cancellation clause, you may check with your state’s statutes how legal contracts without these clauses are dealt with. You may also check with a lawyer to ensure that you follow all the necessary steps to canceling contracts without these clauses. If the contract does not have cancellation clauses or if the contract cannot be canceled with the help of federal laws or state laws, you can negotiate with the other parties involved. 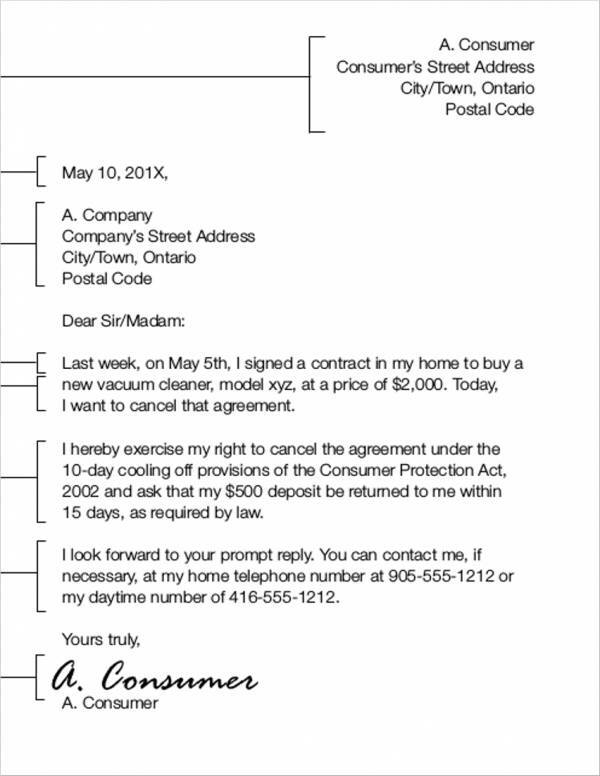 If you come to an agreement letter, it should be written on paper and signed by the people involved. There are two types of fraud: actual fraud and constructive fraud. 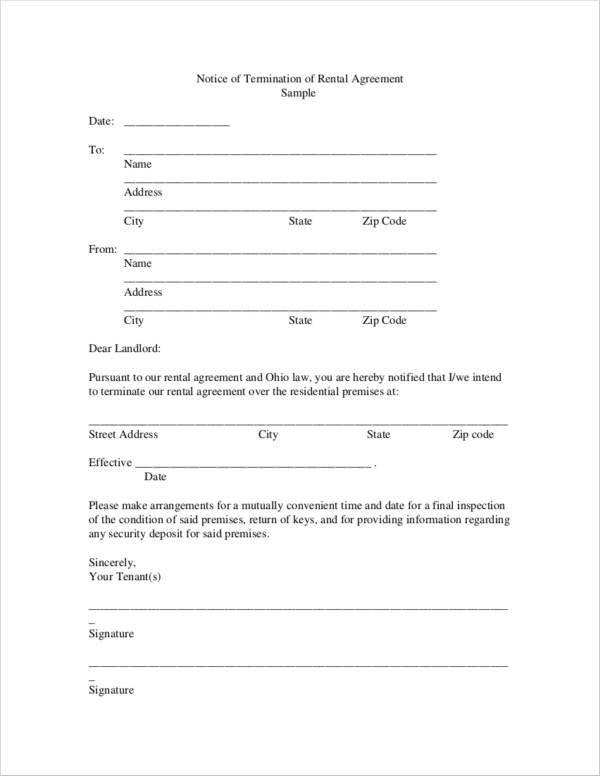 The former situation typically occurs when one of the parties intentionally lies about something stated in the contract. The latter, on the other hand, happens when one of the agreement between parties involved unintentionally lies about something found in the contract. With these situations, one of the parties can choose to have the contract null and void. If proven that an incapacitated person gets involved in the contract without the consent of a guardian, then the contract is considered as void. 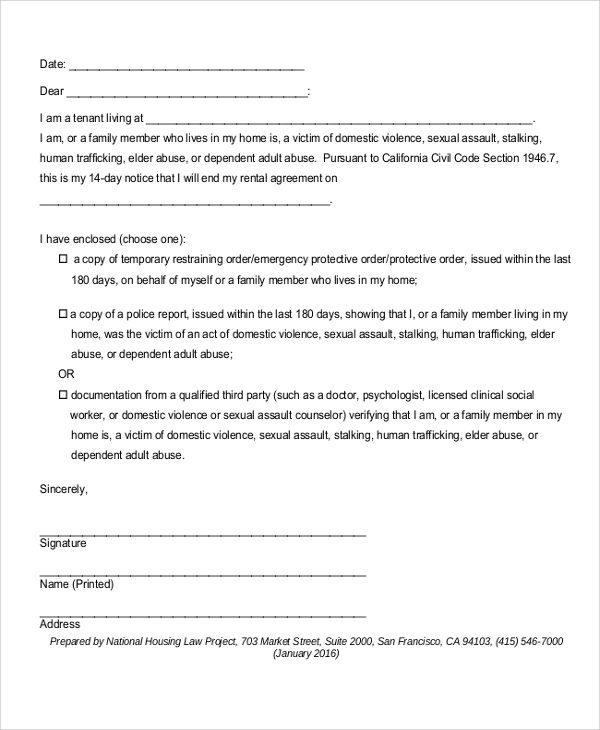 If you signed a contract due to being blackmailed, pressured, or forced to do so, the contract may be considered as null and void. 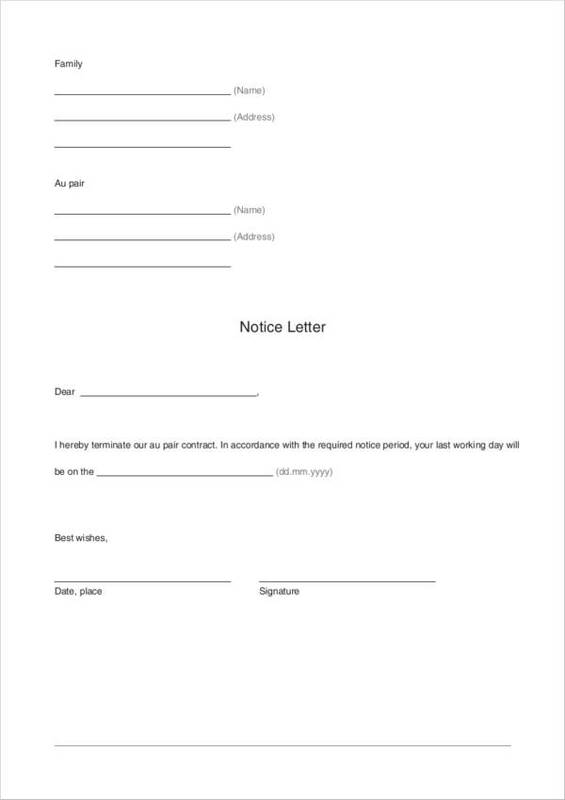 Signing a contract assignment must be done knowingly and on your own free will. The parties all agree that the contract is a mutual mistake committed by all the parties involved. 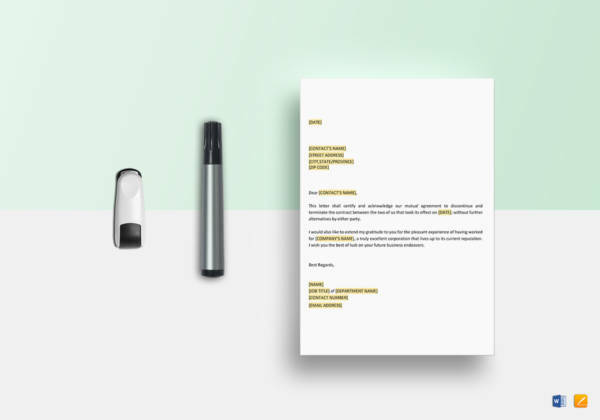 Make sure to write your letter in a professional and formal language. Make sure your letter’s content is decent and polite. Omit the usage of any harsh words or topics that are not relevant to terminating the contract. 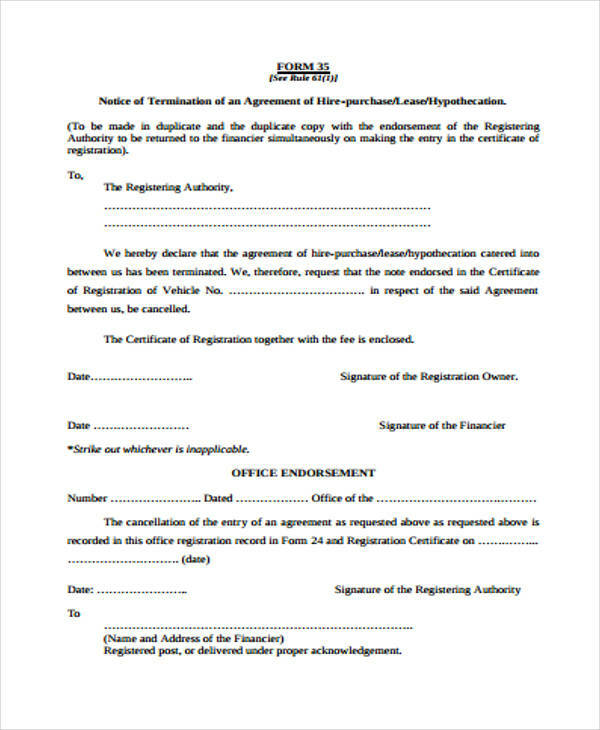 Include a detailed description of the reasons why there is a need to terminate the contract. 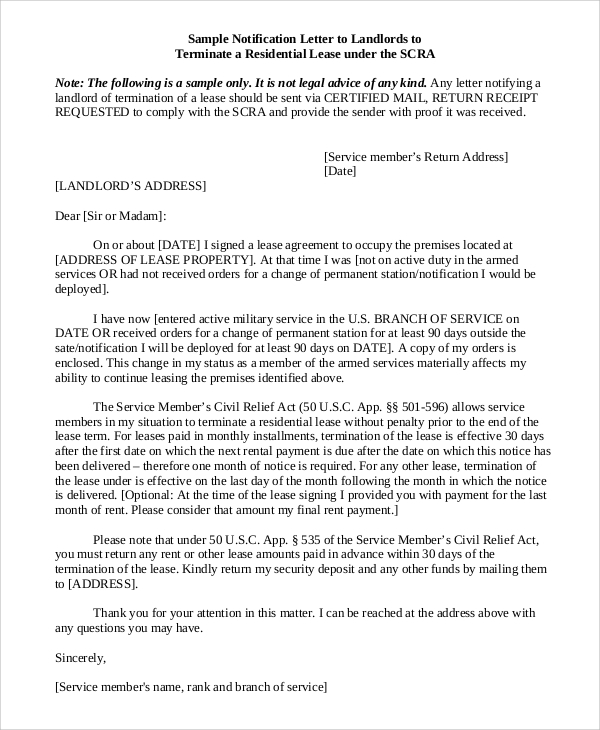 Make sure that the termination date is stated in the letter. Include well-wishes at the end of the letter and do not forget to thank the other party or parties involved.